CoinTerra, a company making Bitcoin ASIC miners, has announced their new service for cloud mining as an alternative to the mining hardware they are making and selling to customers. With available plans ranging from 200 GHS to over 1 PHS, CoinTerra certainly is making some bold claims, especially adding the fact that they promise immediate deployment of the purchased hardware. The interesting thing here is that this is the first hardware manufacturer of ASIC devices to launch their own data center and offer cloud mining services with their own hardware. Other ASIC makers such as Zeus and KnC have also announced their plans, however they have not yet launched similar services offering users the ability to purchase hashrate directly from them. In theory purchasing cloud mining hashrate directly from the hardware manufacturer should provide users with the best possible prices, however that may not always be true. A real world example shows that with the lowest available contact for 200 GHS of hashrate currently being sold for $999 USD you will be paying about 0.0115 BTC per GHS for 1 year contract this is not the cheapest price you can get comparing to other available services. Of course going for higher hashrate such as 2 THS will make the price per GHS more attractive at 0.0092 BTC which is still higher as compared to CexIO where you can currently get 1 GHS at about 0.0069 BTC. To achieve a similar price you would need to go for at least 1 Petahash at CoinTerra, though if you go for 2 year contracts the price you get for the second year is better and if you compare the prices to Cloud Hashing they do look much better. 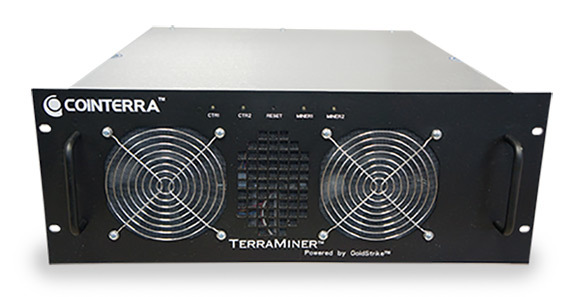 Currently the company sells their TerraMiner IV 1.6 THS Bitcoin Miner for $3499 USD or less than two times cheaper compared to the 2 THS cloud mining plan they have available for 1 year priced at $7999 USD. And there is another thing that is not very clearly defined is if there will be a maintenance fee for the cloud mining hashrate you are going to be purchasing. There is a brief mention of 5% combined fee (including maintenance) in the formula that is being used to calculate your Bitcoin earnings in the CoinTerra Mining Sales Agreement. The maintenance fee is not uncommon for cloud mining services, but with the fee subtracted from our mined earnings and these prices we can easily say that there are already better priced and proven alternatives than CoinTerraMining that not only are offering better price per GHS, but are already well established and trusted and make it much easier for the users to monitor, control and even withdraw earnings as soon as a block is mined and confirmed. In short, good job for CoinTerra to come out with such a service first among ASIC manufacturers, but the initial terms, prices and functionality they are offering does not make the service so much attractive as you would expect.